We've acquired a few new board games lately and today I spent the afternoon organizing the game cabinet. After doing so, I thought I would make a Top 10 list of my favorite games; something I've been meaning to do for a while now. I picked this game up when the 2nd edition failed to meet its Kickstarter goal, because I feared the first edition would soon disappear and I would miss my chance. Even if it lacks the revised rules of the 2nd edition, the theme just sounded too fun to pass up. Who doesn't want to build their own B-movie? 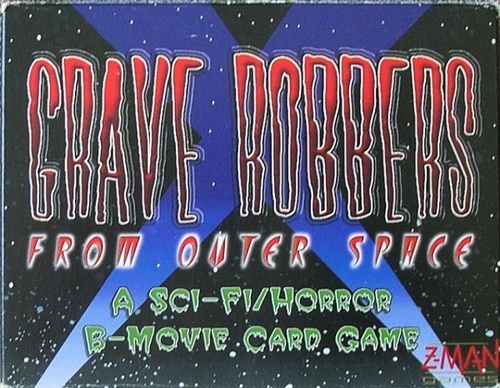 In this game, you're playing cards to the table in front of you to choosing locations, characters, and plot tropes to make your best worst sci-fi/horror flick straight out of the 1950s. I bought this game specifically to play with my B-movie loving best friend, which I will hopefully get to do soon, but I've played it with my family a few times now. The Verdict: It's a fun, light card game that gave us lots of chuckles, but it probably could stand a rules revision to clean up the game play just a bit and I'm bummed we may never see those come to print. The mechanics ar egood, but not great. The theme really carries it and just works perfectly as the premise for a fun card game that's sure to entertain anyone who's into this movie genre. This card game has a fairly generic theme of battlefield combat between two wizards summoning monsters, casting spells, throwing up obstacles.... sounds a bit like Magic The Gathering, doesn't it? It's not. The play style is very different. For one, there are a lot fewer cards, which is a benefit in this case, as it keeps games shorter and rules simple to master. 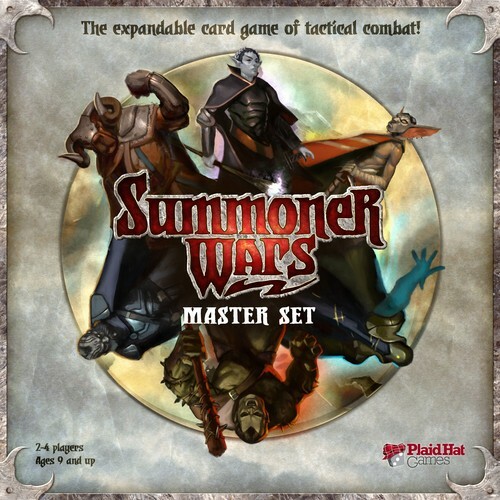 Second, in Summoner Wars you're actually moving your cards around on a battlefield grid to protect your summoner card and defeat your opponent's summoner card. Take out the summoner and you've won the game. The Verdict: A card-based strategy game that I can actually see! Thank you to the makers of Summoner Wars for using reasonably large print and simple iconography with good contrast on your cards. I like this game a lot. It's fast, fun, simple to learn, but provides enough strategy and tactics to keep things interesting and entertaining, giving it tons of replay value. I'm sure I'll be buying expansions for this game, but I also love that the master set comes with 6 factions, giving you a lot of possibilities for mixing and matching opposing factions. 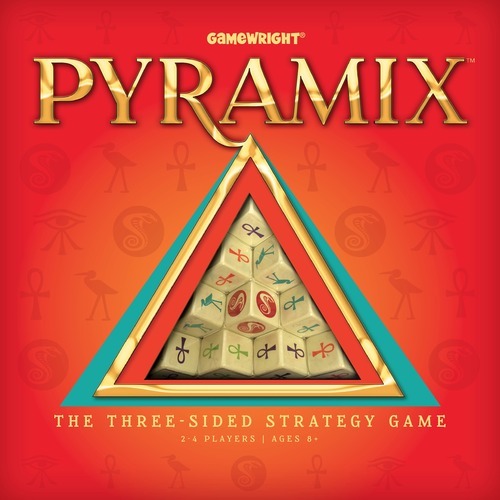 This is a very unique abstract strategy game in which players take turns removing marked cubes comprising an actual pyramid, in an attempt to collect the most cubes of that glyph and color. It's a game that, on the surface, seems very light, but has more strategy to it than it first appears. The component quality is excellent, and the pyramid of diagonally stacked cubes that slide down as you remove pieces is certainly unique. The Verdict This game is for 2-4 players, but don't play it with less than 3 (unless you're playing with a young child). It needs at least three people, preferrably four, in order to present enough of a challenge to be interesting. With only two people, your options for grabbing cubes are so vast that there's really not a lot of stratigic thinking that has to happen. With three or four players, though, options are a lot more limited and you're forced to put more thought into your moves. It's a solid, fun little game with the right amount of players and the components and physical mechanics of the game are very cool. 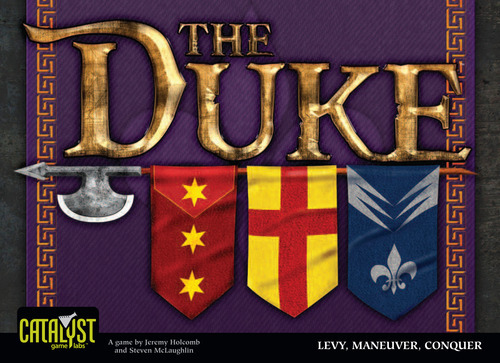 Now, if you want an abstract strategy game for two people that does present a challenge from the get-go, The Duke will do that for you. Think of it as chess, with a variable number of pieces placed somewhat randomly, with movement patterns that alternate each turn. Throw in the occasional special ability and you've got The Duke. The Verdict: I. Love. This. Game. I hate chess and I'm not a fan of Hive, the other game that often gets touted as the "chess killer," but this sounded interesting, so I thought I would give it a try. Wow, am I glad I did. It's a lot of fun, it doesn't get boring or predictable and you don't need to be able to think 8 moves ahead - not that it's a light game. It will definitely give you a mental work-out. It allows for some strategy and planning, but it has a degree of randomness to it as well, which can sometimes make things more balanced. The mechanism of alternating movement for pieces is unique and fun and the component quality is excellent. This game has been getting a lot of buzz, so I was excited to give it a try and thought Rich would enjoy it given the theme. 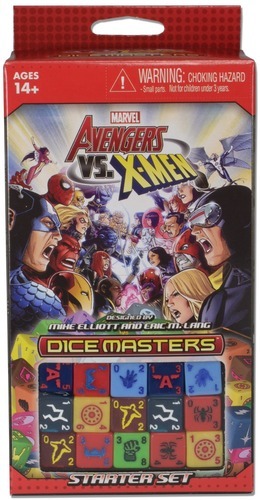 It's similar to Quarriors, a game I'd been wanting to try for a while, but Dice Masters is, I have been told, better. Think of a deckbuilding game, except, instead of building a deck of cards, you're building a pool of dice, with abilities and powers, and battling against one another. The Verdict: I'm sorry to say that this game really did nothing for Rich nor I either one. We mostly just found it boring and sometimes hard to see due to the overall low quality of the dice. I really don't have much more to say about it, unfortunately, because we were just kind of.... meh. Nothing about the game was memorable for us, really. We seem to be doing this a lot. 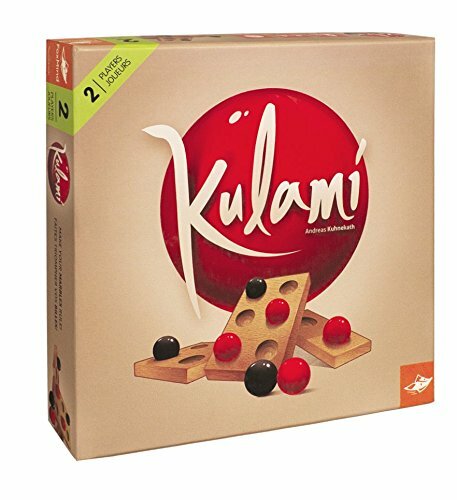 Kulami is another lightweight, abstract strategy game for two people, where you're placing marbles on a board in order to "capture" tiles and score points at the end of the game. Before the game, players build the board by laying out tiles in a configuration of their choice. Then they take turns placing marbles. Placement rules are simple: Someone places a piece and the next person has to put a piece in the same row or column as the marble their opponant just put down. You can't place a piece on the tile where your opponent placed their piece, or on the tile where you placed your last piece. You keep going until all of the marbles have been placed, or until someone is unable to make a move. The Verdict Kulami isn't going to make it into my top 10 list. It probably wouldn't make it in my top 50 list. But if you're looking for a short, two-player game that's a little bit thinky and easy to pick up, Kulami is a solid choice. I enjoy it. It's not mind-blowing fun, but it's entertaining, with very nice production values. It would be a great game to play with your kid to get them thinking a little. I didn't back the Kickstarter, but once this hit Amazon, I picked up a copy, against my better judgment. The only reason I purchased the game was because I have a friend who I thought would enjoy it. The rules in a nutshell are "take turks flipping over cards until someone gets an exploding kitten and then that person is out." Of course, there are cards you can play to stop this (defuse cards) and other cards with special abilities that can also be played along the way. The Verdict It was exactly what I expected; a lot of childish, cat-themed humor and not much actual game. This is a less-fun version of Boom-O. 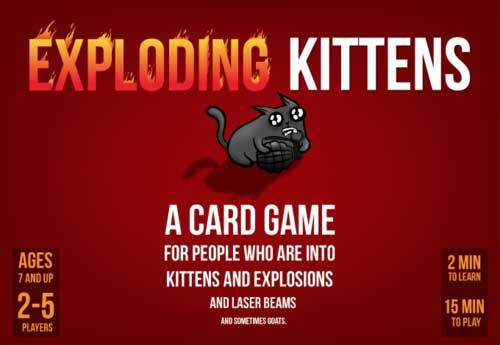 If the idea of a player elimination card game about things that explode appeals to you, skip Exploding Kittens and buy Boom-O instead. If, on the other hand, Oatmeal flavored cat humor is your thing, you might enjoy this for one or two plays. I'll finish off this list with a Kickstarter game I did back. 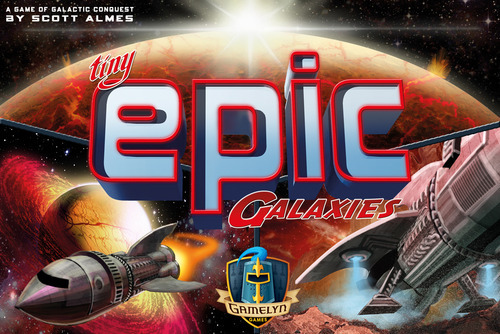 Tiny Epic Galaxies is the 3rd in the Tiny Epic line of games by Gamelyn Games, and it's all about space exploration, collonization, resource management, and dice rolling. In this game, players are trying to grow their empire by colonizing new worlds and building up their ecconomy and culture. With a solo variant (that I haven't tried) the game plays from 1 to 5 players. The Verdict: It's a lot of game in a small box. It's fast, it's fun. It plays very well with two players. I really like this game. It's also another easy to see card game, which was a pleasant surprise given its small size. I'm a sucker for space-themed games in general. It's probably my favorite genre, but this game wins on more than theme alone. Don't get me wrong; the theme is fun and the artwork and wooden rcoket ships that look like they came out of the 50s are great, but more than that, it's just a really fun game. It took a bit to get used to the dice mechanic since, unlike most dice-based resource menagement games, you don't actually spend resources on the dice - rather, they allow you to perform actions relating to that resource using things you already have (abilities, orbiting ships, stockpiled resources). Once you get past that, though, the game is easy to learn. So there you go, a run-down of game purchases over the last 3-4 months. Next time, I'll do that top 10 list. Spoiler: More than one game here appears on it.